Tzolk’in Date: 12 Cimi. Ruler is White. Blocker is Blue. Gatekeeper is Venus. Associated Qualities: surrender, sacrifice, release, transmutation, forgiveness, humility, revelation, discipline and organizational skills; sense of duty and commitment to community, luck. 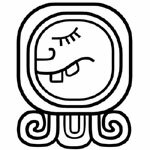 If you explore the Tzolkin calendar online, you will come across programs that will tell you what Mayan day you were born. According to these calculators, my birthday corresponds to 7 Cimi. So obviously, I’ll pay just a little more attention to the meaning and message of this glyph and I did a little more research on it for this blog. Always, I try to be practical and even tempered about such things as astrology and similar esoteric means for achieving guidance. When I was younger and more impetuous, I’d “throw” the I-Ching so often to help me make decisions; it came to be more of a hindrance to action than a blessing. I’ve known, also, for a long time, the seeming discrepancy between classical Western astrology’s sidereal and tropical methods which recently was “exposed” in the popular media. I read an article in this week’s TIME about this. –Yes, I suppose it throws off all the newspapers’ superficial versions of the daily horoscope and certainly gives debunkers and cynics more fodder for their cannons. True self knowledge ne’r doth come cheap or easy….Who said that anyway?…oh….that was me. All this being said….In terms of my own life’s course, personality, character and such, I have to say, I can “relate” to much of what is associated with Cimi. As a devoted spiritual seeker since my late teens, with a BA in religious studies, I’ve often stated that one of my favorite topics of conversation is Death, and life after Death. It’s the bottom line ultimate mystery of human existence. The idea of sacrifice “speaks” to me too. As one with deep Christian sensitivities, I appreciate the value and virtue of giving of oneself. And I “relate” to the challenge of not being overwhelmed by—as one commentary described–“feeling obliged to make sacrifices for others.” This can lead to “victimhood” thinking. Indeed, as I go into the fourth year of caring for my two elderly parents, living at their home away from my husband and West Virginia home, this challenge is very, very real for me. With all this heavy duty info at my fingertips, I was somewhat relieved to read on a website called The Mayan Calendar Portal that “There is, almost invariably, a special kind of softness about people born on the day sign of death. In ancient sources, it was considered to be the luckiest of days and Death persons were supposed to be very successful in business.” So, when I win powerball, I will then go into all manner of businesses. I can’t wait! A few other tidbits: Grandmother Pa’Ris’Ha once gave a course in The Ancient Language which was all about the symbols used in glyphs worldwide. The closed eye that can be seen in the above Cimi glyph, she said, symbolizes “blessings.” For that reason alone, I’ve always taken a liking to Cimi along with the notion that Cimi often seems to be an “easy” day for me. Well, the Portal website also said: Cimi “is the sign of the cycle of life, death and rebirth. The Maya saw death as the creator of life, and contact with their ancestors served to activate inherent psychic abilities. This day sign is particularly gifted with these abilities and should use them as tools to assist others.” Kinda cool. This entry was posted in Uncategorized, Wellness and Spirituality and tagged Death, Du'TSu, Grandmother Parisha, Life After Death, Maya Angelou, Medicine Wheel, Pa'Ris'Ha, Spirituality, the Dalai Lama, Tzolkin, Wellness and Spirituality, WellnessAndSpirituality.net. Bookmark the permalink.